The Hudson’s Bay Company built Fort Colville on the south bank of the Columbia at Kettle Falls five years after merging with its rival North West Company in 1821. In the merger, the Bay Company acquired Fort Spokane at the junction of the Spokane and Little Spokane rivers 60 miles south. The North West Company built Fort Spokane in 1810. George Simpson, the Bay Company’s governor of the Northern Department of Rupert Land, which included the Columbia drainage, personally selected the site of Fort Colville and negotiated with local Indians to locate it there. While he found Fort Spokane “delightfully situated,” he was a penny-pincher and decided that the Colville location, adjacent to the Columbia, would reduce the expense of delivering furs and goods and had better potential for farming. In this, Simpson followed the advice of Alexander Kennedy, his chief Factor at Fort Spokane, who wrote in his annual report for 1822 that the fort was difficult to supply and that that Indians “monopolized” the salmon fishing. Simpson, visited Spokane House on October 28, 1824, and later ordered it moved to the Kettle Falls site. Simpson named the new fort after Andrew Colville, a Bay Company director. The move was completed in the spring of 1826. Fort Colville quickly grew in importance in the Bay Company’s operations. The farm was particularly successful, as Simpson hoped it would be. Wheat initially did poorly, but later thrived, as did vegetables and livestock. By 1828 Fort Colville supplied all of the interior Columbia River Basin posts of the Bay Company, allowing Simpson to reduce the number of men employed in transporting goods from Fort George, at Astoria or Fort Vancouver to the interior. Between 1826 and 1830 more than 15,000 beaver pelts were processed through the forest, but their numbers steadily declined — in part due to the company’s decision to trap as many as possible to discourage competition from Americans. Resolution of the international border in 1846 — Fort Colville now was in America — and the steady decline of the fur trade, coupled with the unrest of the Indian wars in the 1850s, the company gradually shifted its operations north into Canada. The United States Army established its own Fort Colville in 1859 about 14 miles south of the Bay Company’s post, initially to provide escorts to parties that were surveying the international boundary. 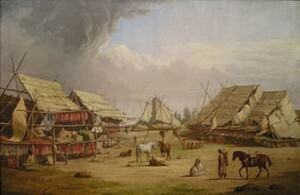 Illustration of indian camp at Fort Colville. Credit: Wikipedia.